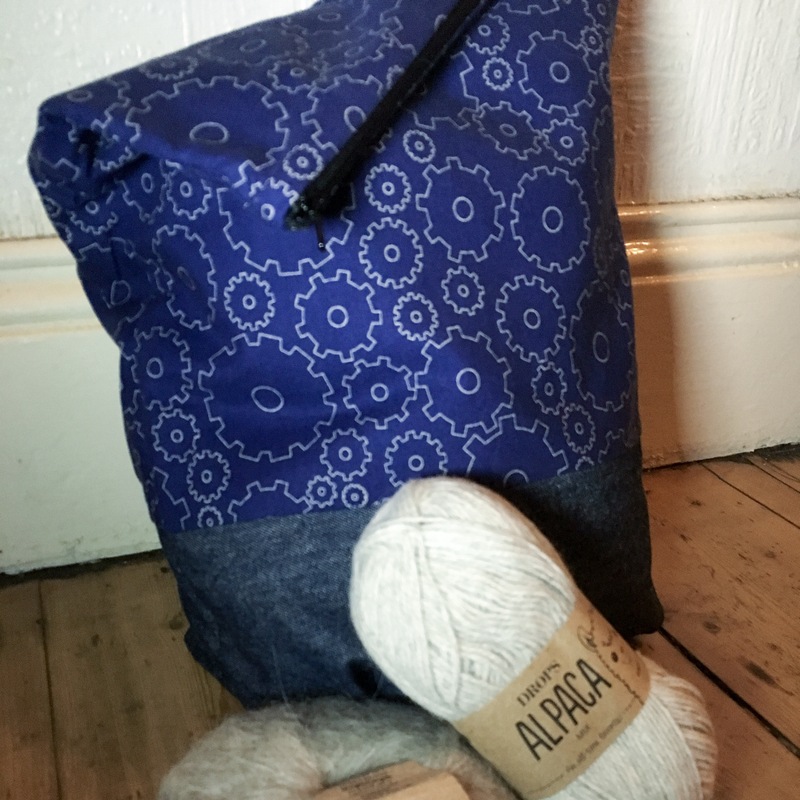 My big knitting projects… my poor jumpers and cardigans… which I tend to keep on the corner of the sofa cushion keep getting kicked onto the floor…. The ball of wool rolls off in one direction, the knitting in a crumpled and unloved heap. Ok maybe I’m getting a bit melodramatic, but seriously guys, this is a problem. So I dived into my remnants pile (yep, I’ve got a whole pile of them) and set too making a good sized project bag. 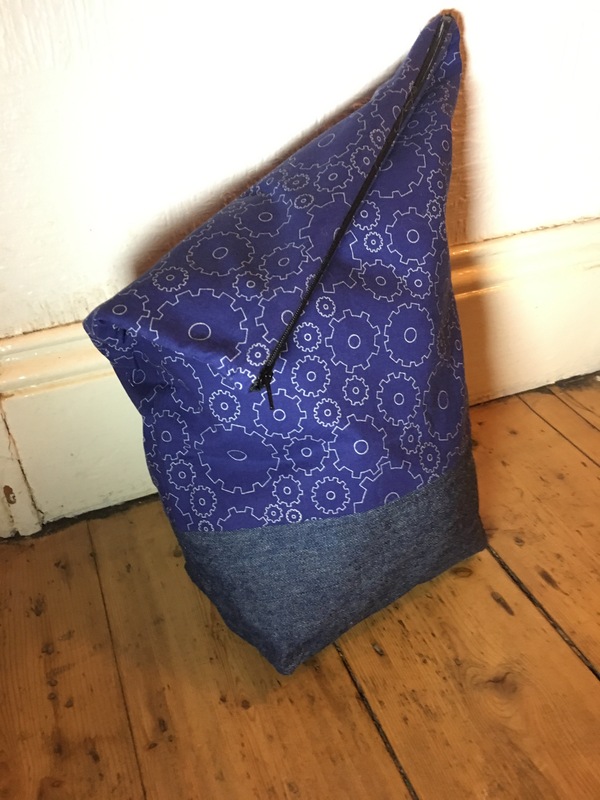 I used some cute cogwheel leftovers from a skirt I made nearly a year ago, and some sturdy denim as I didn’t have enough interfacing to cover the lot. I wanted it to have some stiffness and keep its shape as much as possible and I figured the denim could manage this fairly well. I followed a step by step tutorial by Design Sponge who set it out so easily an idiot can do it… I’m the proof! 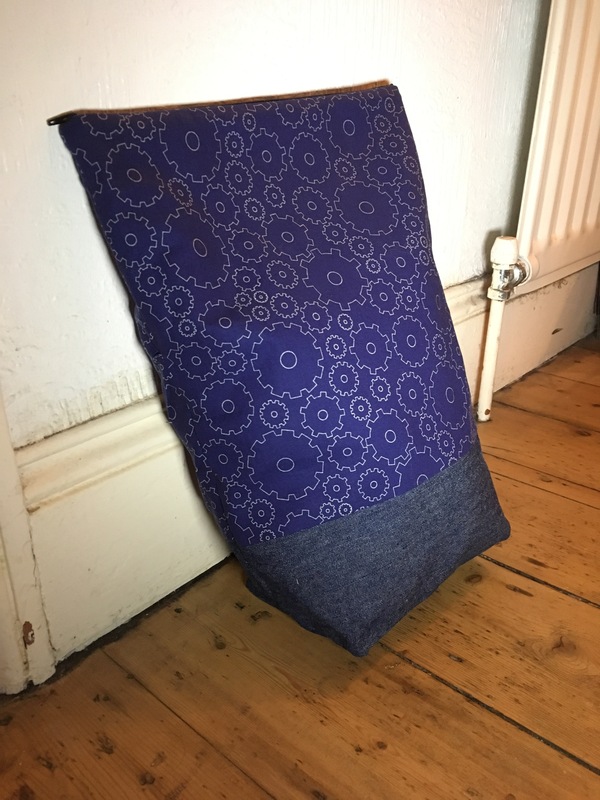 I particularly liked this tutorial as it’s for a fully lined and flat based pouch. Not too complicated but a good sturdy shape. My version is tall and relatively thin as I didn’t have a giant zip, so I just used a dress zipper I had lying around. I also decided to get all complicated by making the outside two tone. This was easily achieved by just dividing the outside rectangle and making sure each piece has at least 1/5″ of Sean allowance. 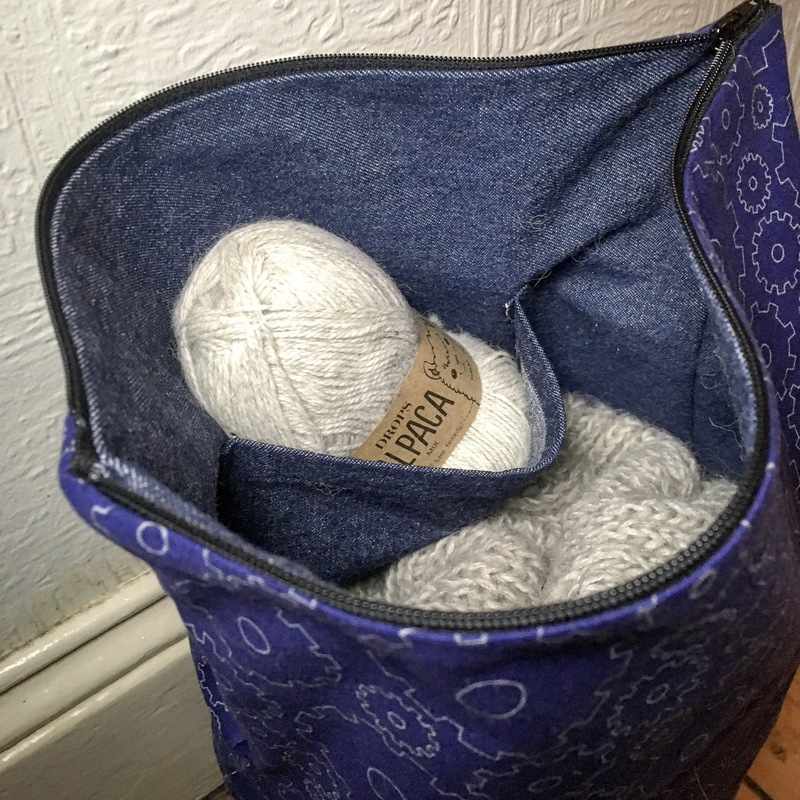 I then decided to be a show off and before I attached the sides to the zip I popped a pocket on the inside… because you need somewhere to keep your pattern page and stitch markers. Ha ha… radiator for scale. You can kind off see that the base has been folded into a rectangle at the base, I’m not showing a close up as I’m somewhat ashamed of my wonky seams! And if you’re wondering…. currently residing in my baggy is my Flaum Cardigan… production on that has seriously slowed since I hit the fishermans rib! So much knitting for so little progress…. but my spare balls for in there too so it’s all nice and neat in one place!